Artificial Intelligence in Practice is a fascinating look into how companies use AI and machine learning to solve problems. Presenting 50 case studies of actual situations, this book demonstrates practical applications to issues faced by businesses around the globe. The rapidly evolving field of artificial intelligence has expanded beyond research labs and computer science departments and made its way into the mainstream business environment. Artificial intelligence and machine learning are cited as the most important modern business trends to drive success. It is used in areas ranging from banking and finance to social media and marketing. This technology continues to provide innovative solutions to businesses of all sizes, sectors and industries. 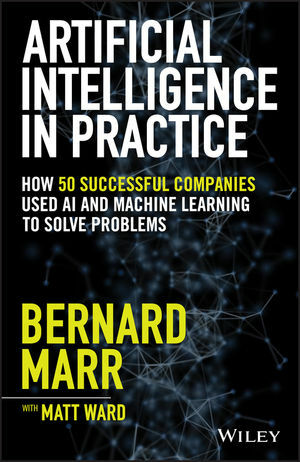 This engaging and topical book explores a wide range of cases illustrating how businesses use AI to boost performance, drive efficiency, analyse market preferences and many others. BERNARD MARR is the founder and CEO of Bernard Marr & Co and an internationally best-selling business author, futurist, keynote speaker and strategic advisor to companies and governments. He is one of the world's most highly respected voices and a renowned expert when it comes to topics such as artificial intelligence and big data. Marr advises many of the world's best-known organizations on strategy, digital transformation and business performance. He is the author of Big Data in Practice: How 45 Successful Companies used Big Data Analytics to Deliver Extraordinary Results and Big Data: Using SMART Big Data, Analytics and Metrics To Make Better Decisions and Improve Performance, both published with Wiley. MATT WARD is the research lead for Bernard Marr & Co. Matt has a background in investigative journalism and spent the last few years working closely with Bernard Marr on the latest technology topics. Matt is an expert and experienced writer in the field of business technology and artificial intelligence, where he has worked with companies such as IBM, Intel, Citibank and NASA.